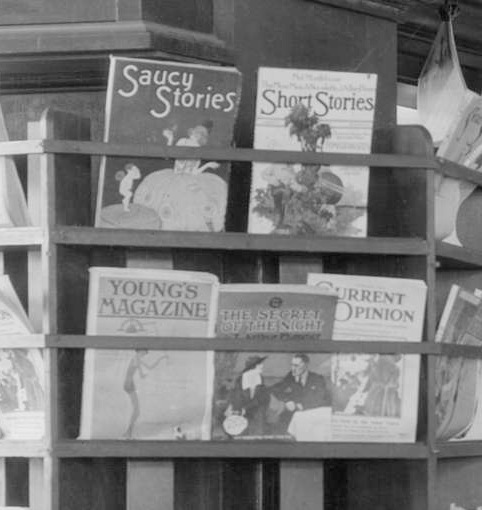 The magazine rack at the Marpole BCER station in 1921 had the run of the mill publications on display, but up high on one rack is an issue of Saucy Tales. Begun in 1916, Saucy Stories lasted for 127 issues. Originally published by Nathan & Mencken it was soon sold to the Inter-Continental Publishing Corp. It cost 20 cents an issue. The covers could get quite racy in the 1920s. Also on the rack are Short Stories, started in the 1890s and published until 1959. In the 1920s and 1930s, it was best known as a publisher of Western stories. Young’s Magazine was published from 1897 until the 1940s. The Secret of the Night remains a mystery, it is not the detective novel by Gaston Leroux. Current Opinion began as the literary magazine Current Literature: A Magazine of Record and Review in 1888, it was absorbed into The Literary Digest in 1925. Previous Post Fort George Forever! Hi John I like what you are doing – interesting and original.